Despite my love of the game, I've done little reading about it compared to some of my more fanatic friends. Apart from routine newspaper stories, I've read several short pieces by Roger Angell and John Updike, and four great books: Jimmy Breslin's Can't Anybody Here Play This Game, about my now-beloved Mets' shambolic first season; Roger Kahn's The Boys of Summer, about my first baseball love, the 1955 Brooklyn Dodgers, and his Good Enough to Dream, about a year spent as owner of an unaffiliated Class A minor league team, the Utica Blue Sox; and Nine Innings by Daniel Okrent, which describes, inning by inning, batter by batter, a typical regular season game, this one between the Baltimore Orioles and Milwaukee Brewers, in 1982 (my only complaint is that Okrent chose an American League game, in which the DH rule makes things less interesting). I've also read Neil Lanctot's Campy: The Two Lives of Roy Campanella, a biography of my first baseball hero, which I reviewed here. It's an excellent book but, as I noted in the review, it's more a personal and social history than a baseball story. I've never read Jim Brosnan's The Long Season or his Pennant Race. Based on what I read today in his New York Times obituary--Brosnan died last week at the age of 84--I want to read them. 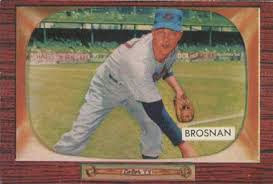 Brosnan didn't have the benefit of any college level creative writing courses; according to the obit he was drafted by the Cubs at the age of 17, and continued to play professionally, apart from two years service in the Army, until 1963, when he was 33. The obit says that as a child he was a reader, as well as a musician and baseball player. Evidently the reading paid off. The obit quotes Al Silverman, in a Saturday Evening Post article from the time Brosnan's career was still underway, as writing "Brosnan is quite possibly the most intellectual creature ever to put on a major league uniform.” This reminded me of a Yogi Berra anecdote I read about some time ago. A writer asked Yogi if any of his Yankee teammates were intellectuals. Yogi thought for a minute, then named one player. "Why do you think he's an intellectual?" the writer asked. Yogi said, "I saw him reading a book without any pictures."